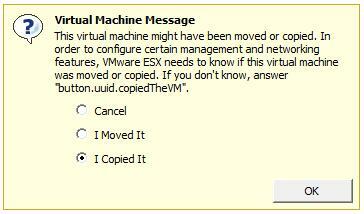 I've moved or copied a virtual machine, and now when I start it, the question is raised - Do I select Moved it? or Do I select Copied It? I've selected Copied, and now all My IP addresses have changed! Why? The virtual machine messages reads "This virtual machine might have been moved or copied. In order to configure certain management and networking features, VMware ESX needs to know if this virtual machine was moved or copied. If you don't know, answer "button.uuid.copiedTheVM". There is and error in the message in the above VMware vSphere Client 5.5, and the last part should read If you don't know, answer "I Copied It" This could also appear as "I _moved it" or "I _copied it" depending upon version of VMware vSphere Client used. 1. What is this Virtual Machine UUID thing? Before continuing this article we need to understand what this UUID thing is, and what it is. The Universally Unique IDentifier (UUID) is a 128-bit integer which is automatically generated and assigned to a virtual machine at power-up, this is stored in the SMBIOS system information. Standard software packages which can scan for the SMBIOS string can extract this information, two software packages are SiSoftware Sandra or Belarc Advisor. This UUID is used in system management, and the same UUID exists on a physical computer. This UUID is unique and the virtual machines digital fingerprint. The UUID is based on the physical path location of the virtual machines configuration file (VMX) and virtual machines identifier. This UUID 128-bit interger value is stored in two places, it's stored in the VMX - virtual machine configuration file, and the virtual machines BIOS. When you move or copy the virtual machine, the location of the VMX (virtual machine configuration file) changes, it no longer matches the value stored in the VMX file or BIOS. When you then attempt to power up the virtual machine, you will be offered the choice of creating a new UUID (I Copied It) or keeping the old UUID. (I Moved It). It's important to understand the changes that are made to the virtual machine, by selecting either of these options. The virtual machines UUID is used to generate other values in the virtual machine, one of these values is the Media Access Control address, or commonly refereed to as the MAC address. The MAC Address is a unique network identifier which is programmed in to all network communication devices. All network devices on a network, need to have a unique MAC address, e.g. every network devices will have a different MAC address, if you have duplicate MAC addresses, you will experience communication issues. If the UUID changes the MAC Address will change. If the MAC Address changes, and you are using DHCP, it's likely you will also receive a different IP Address, because the DHCP server, will detect this network device, as a new device, and assign a new and different IP Address. If you select I Moved It, you have changed the datastore location, this changes the uuid.location setting in the virtual machine configuration file (VMX). The uuid.bios and the current MAC address will remain the same. see before and after comparisons of the virtual machine configuration file (VMX). In the above comparison screenshot, the RED highlighted uuid.location is the original "before" and the GREEN highlighted uuid.location is "after". As you can see the uuid.location has changed, but the uuid.bios and MAC Address - ethernet0.generatedAddress are exactly the same. If you select I Copied It the uuid.bios and uuid.location value are changed, this forces the ethernet0.generatedAddress to also change. see before and after comparisons of the virtual machine configuration file (VMX). In the above comparison screenshot, the RED highlighted uuid.location is the original "before" and the GREEN highlighted uuid.location is "after". As you can see the uuid.location has changed, and the uuid.bios and MAC Address - ethernet0.generatedAddress have also changed. I Moved It - should be used only, when you are manually moving a virtual machine between datastores, which includes moving to a new host and different datastore. I Copied It - should be used when you want to COPY or CLONE a virtual machine, and used on the network at the same time as the original virtual machine. As we've seen above, selecting "I Copied It" changes the uuid.bios and uuid.location values, which will force and generate a new MAC address. If you have been using DHCP (Dynamic Host Configuration Protocol) to supply IP Addresses to your computers on your LAN, your virtual machine will receive a new IP Address, after this change. I hope this article helps you to understand the difference between "I Moved It" or "I Copied It" when you have moved or copied a virtual machine.